At Gran Paintball Madrid safety is of most importance. 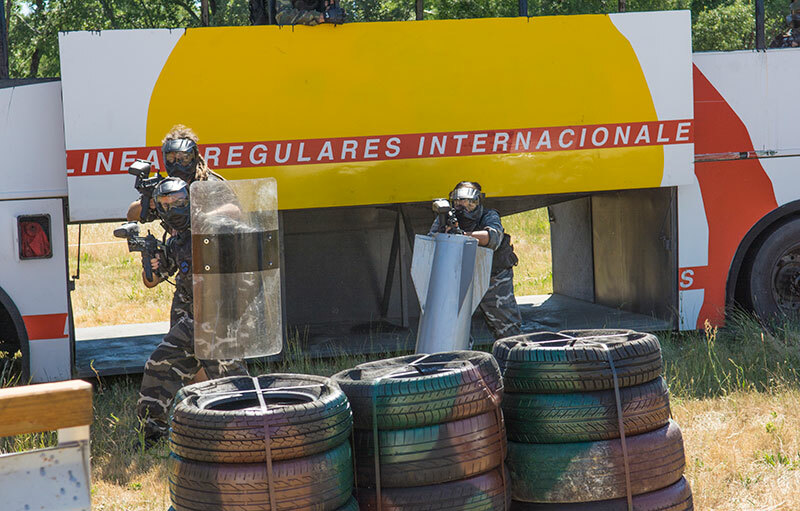 Playing Paintball in Madrid is not dangerous if you observe some minimum rules, which will be explained by qualified instructors at the beginning of each event. Following these rules is essential, as we are not responsible for any accident resulting from non-compliance. NEVER REMOVE YOUR MASK DURING THE GAME and until you reach the neutral point indicated on the instructor. Failure to comply with this rule will result in immediate disqualification and, in the event of repeated warnings, expulsion from the Paintball fields. While not in use, the marker should have the safety catch and pacifier on, the finger off the trigger, and be pointing to the ground. Smoking is strictly forbidden throughout the farm, except in the places specifically designated for it. The indications given by the instructors must be followed at all times. Once the material has been delivered, each player is responsible for it and must deliver it at the end of the game in perfect condition. If you have an opponent less than 6 meters away, you must not shoot, but you must warn the person you are aiming at that he or she is eliminated. It is strictly forbidden to shoot, aim, frighten or annoy people outside the game or animals. Shooting in or towards the neutral or base zone is absolutely prohibited. Do not load markers with used balls. If you drop them you just have to tell us and we will replace them at no cost. Use extreme caution with compressed air bottles. In no case shall they be manipulated, thrown or separated from the marker without the supervision of the instructor. Physical contact between participants will not be permitted. A control of the maximum speed allowed for balls, which will never exceed 300 fps. Control of the shelf life and quality of the balls so that they are always in an optimum state, regardless of temperature. These will in any case be biodegradable and non-toxic. Markers homologated and subject to periodic controls. Anti-thermal and perfectly clean double lens masks, so that nothing tarnishes your vision. Referees with extensive experience in all games and in all groups. You can always go to them if you have any questions or suggestions. Optimum load of compressed air in the bottles, without exceeding the maximum authorized. Teams will include neck protection vests, as well as vests for both women and men.